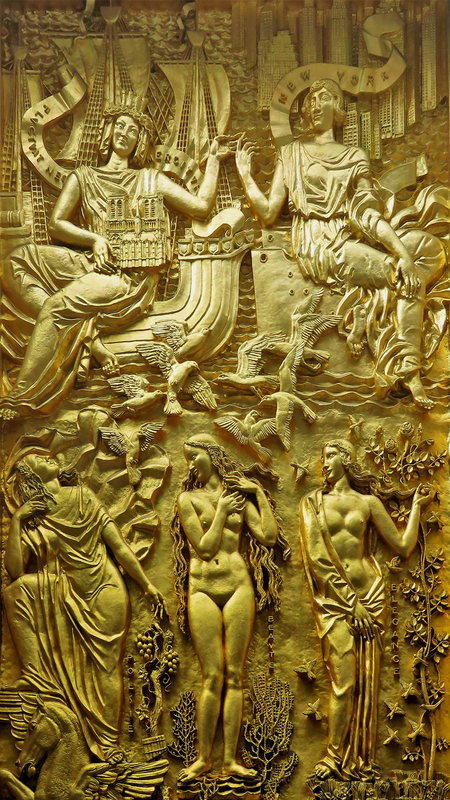 Pictured is the gilded relief entitled, “Friendship between America and France.” In its top half are seen two larger than life females holding hands, symbolizing the alliance between Paris and New York. Below them are the Three Graces, Poetry, Beauty and Elegance. It appears on the façade of the Maison Française, in Rockefeller Center (610 Fifth Avenue). It is by Alfred Janniot, 1934. Though difficult to read, the banner behind the figure representing Paris reads, Fluctuat Nec Mergitur. This Latin means, She is tossed by the waves but does not sink and has been the motto of Paris since the middle ages. Family and friends are important. Without them, we go through life alone. At this time of year, it is traditional to renew these relationships. When we were young, it was easy to make friends and our family enveloped us. As we grow older, new friends are harder to make and our seniors and peers begin to pass. Thank God for children! In this season, gifts are given as symbols of our affection, tokens of our love, but it is shared time together that is most treasured. This entry was posted in Art, Family and tagged NYC by RegenAxe. Bookmark the permalink.